The year 2014 has been a great and productive year here at Brookville Glove. We have implemented many projects and campaigns throughout the year which has expanded us on a national basis and the addition of new customers. Our greatest accomplishment in 2014 is the Gurly Bear Campaign to raise Breast Cancer Awareness! Due to the ever growing response we will continue it in years to come! Our new marketing campaign is a national mailing campaign to target more customers nationally to educate the public and different industries of our American Made products! In addition to the national marketing campaign, we will be attending the National Hardware Convention in Las Vegas in May to showcase our gloves and products! We are excited to expand business and grow even larger in 2015. Brookville Glove is ready to kick of 2015 with a bang! These gloves are limited supply and will go fast! Order while you still can! In December 2014, Brookville Glove and it’s Sister Company, Utilities and Industries celebrated the holidays at their annual party. To spice things up this year, we put a twist to all of the employees gifts! Pictured to the right you will see many different gifts with a number tag attached to them. There were a total of 55 different gifts and each person was handed a Christmas card with a number and lottery ticket in it. Whatever number they received in the card determined which gift they got! It was a huge hit! In addition to the gifts, Utilities and Industries and Brookville Glove handed out awards to their employees for years of service and perfect attendance for 2014. We like to do something special in recognition of their hard-work and dedication to the company. Overall, the tradition was a big hit and will continue in years to come. Our featured glove this month is our Burly Bear, 69 Brand. The Burly Bear 69 is one of four in this brand. This particular glove has a different cuff than the other three Burly Bear Gloves we manufacture. This glove can be used for farming, construction, welding and general labor. This Burly Bear is made in the USA out of 100% American Made 18 oz. gold and white cotton. It is double palmed and has a cotton liner with a gauntlet cuff. This Heftee glove is made in the USA out of American made 22 oz. white cotton material. This glove is double palmed and is a twill out glove with a gauntlet cuff. The Heftee Gloves are hemmed with various styles of cuffs. This glove can be used for anything dealing with heavy duty work, such as; factory workers, steal workers, iron workers, and construction. Brookville Glove is planning to kick off the New Year in full force! With many new projects, customers and implementations happening our goal is to keep heading in the same direction as we are now. One goal we are working towards, is expanding the business on a national basis and getting our American Made Gloves in the hands of different industries who would benefit from our product. Another major goal is to work on shrinking our lead times. Brookville Glove is developing a process to shorten the time it takes between the purchase date to the gloves being made to shipping gloves out. We have already shortened this majorly, but we are looking to shrink the time even more with our new ideas! Our final goal is to attend as many convention shows to showcase our business and products to potential clients and industries who would benefit from our line of products and brands. Brookville Glove has seen a positive outcome in 2014 and are anxious to see the new ideas play out in 2015. 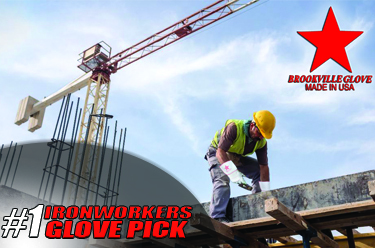 In December, Brookville Glove’s Factory Store and Management Offices underwent construction of adding a roof over all the spaces. Due to the company growing we are ready to expand our offices and factory store space. By adding a ceiling we allowed more storage space above for the expansion of products and created a noise barrier when customers or clients come to visit while production is in process. We are excited about the new addition to our facility and things are already moving along great.